The Oakland A's are in the middle of the pennant race and begin a fairly important series this weekend against the Baltimore Orioles. So, clearly, we are here to talk about the "Bernie Lean" video featuring various members of the Oakland Athletics, and ATM and IMD. (The Athletics were so proud of the video they sent it to us.) A quick Google search reveals that ATM and IMD are the men responsible for a song referencing a Weekend at Bernie's II plot point (it involves voodoo, dancing and a corpse, if you are unfamiliar). 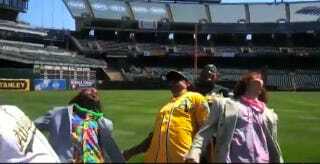 Capitalizing on the dancing corpse sensation currently gripping the city of Oakland, the Athletics have made the video you see below. It begins with the death of Coco Crisp via pop fly off the dome and his subsequent semi-resurrection. Dancing corpse hilarity ensues. It's all a wacky, fun-loving and fan-friendly fad right now—albeit a couple decades late—we just hope it does not give the rapidly recovering Brandon McCarthy any kind of PTSD or anything. Although we imagine he's still on some pretty serious pain meds so maybe none of this is real and all part of some Brandon McCarthy hallucination. Makes just as much sense as Weekend at Bernie's II.